The Port Alberni Port Authority and Port Alberni Marine Fuels and Services Ltd. reached an agreement before the festival. Sep. 1, 2016 8:00 a.m. 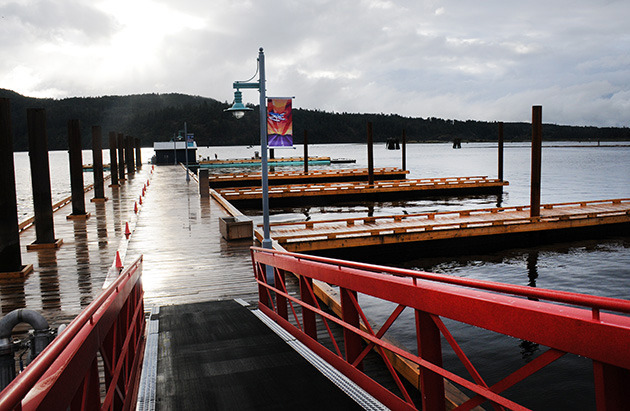 The new fuel dock at Tyee Pier will be open for Salmon Festival boaters as of 5 a.m. Friday, Sept. 2. The Port Alberni Port Authority and new fuel company owners Doug and Sandi Smith reached an agreement “that will enable them to do business from the new fuel dock at Tyee Pier beside Fisherman’s Harbour this Salmon Festival Labour Day long weekend,” said Dave McCormick, director of public relations and business development for the port authority. The Smiths, operating as Port Alberni Marine Fuels and Services Ltd., and their young crew were busy stocking the convenience store Thursday night that is part of the fuel dock. The dock includes two gas hoses and two diesel hoses for smaller boats, as well as a high-speed diesel hose for commercial vessels. The dock is 160 feet long and deep, and can accommodate boats up to 200 feet long, Doug Smith said. The facility also includes three ‘fingers’ that are 80 feet long that the port authority built for boats. Opening the fuel dock is a dream come true for the Smiths, Sandi said. The Smiths were the Imperial Oil dealer at Brechin Point Marina in Nanaimo 10 years ago. “We’ve looked at getting back into running a marine service station again,” Doug said. “We just had to find a place,” Sandi said, adding that they looked at other locations on Vancouver Island before deciding Port Alberni. The Smiths built the dock and convenience store with main contractors Porter Petroleum, Aines & Tyler and Coastal Bridge Construction. “If it’s yellow cedar, it belongs to the port authority. The rest is ours,” Doug said. The port authority will also be selling fuel during Salmon Fest from Clutesi Haven Marina and China Creek Marina as usual, McCormick said. Tyee Pier is part of Tyee Landing, the new boardwalk and paved area between Somass Mill and Fisherman’s Wharf that officially opened on July 21. The Harbour Quay/ Fisherman’s Wharf area has been without a fuel dock since Columbia Fuels shut down their dock at Harbour Quay in 2008.